Nominated by Franklin D. Roosevelt on April 24, 1939, to a seat vacated by George Hutchins Bingham. Confirmed by the Senate on June 1, 1939, and received commission on June 3, 1939. Served as chief judge, 1948-1959. Assumed senior status on June 12, 1959. Service terminated on May 22, 1968, due to death. Dargo, George. "Calvert Magruder of the First Circuit: The Law Professor as Judge." Massachusetts Law Review 74 (December 1989): 239-46. 17 linear ft. (ca. 12,000 items); finding aid; correspondence, memoranda, telegrams, drafts of opinions, speeches, legal documents, bibliographies, research notes, clippings, and other printed matter relating to Magruder's teaching, judicial, and public service careers. 1 folder; finding aid; collection contains the constitution of The Most Noble and Lofty Society of W.H. (Women Haters) as copied by its president, Calvert Magruder. United States Circuit Court of Appeals (1st circuit) Judges, 1950. 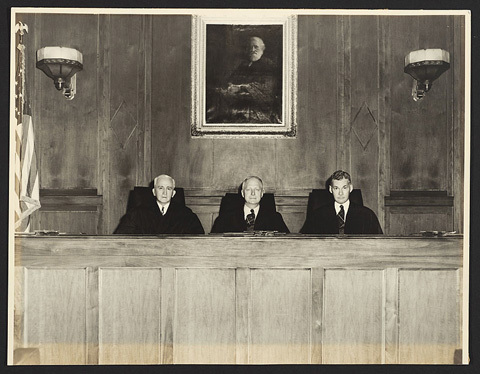 John Mahoney, Chief Justice Calvert Magruder [center], Peter Woodbury; artist unknown; Photograph; 1950; Legal Portrait Collection, Harvard Law School Library, Cambridge, Mass., record identifier: olvwork203511. Reference image courtesy of Historical & Special Collections, Harvard Law School Library. Further reproduction prohibited without permission of the library. Calvert Magruder; by Louis Fabian Bachrach; Photograph; n.d.; Legal Portrait Collection, Harvard Law School Library, Cambridge, Mass., record identifier: olvwork203510. Calvert Magruder; by unknown; Photograph; ca. 1924-1926; Faculty Portrait Collection, Harvard Law School Library, Cambridge, Mass.